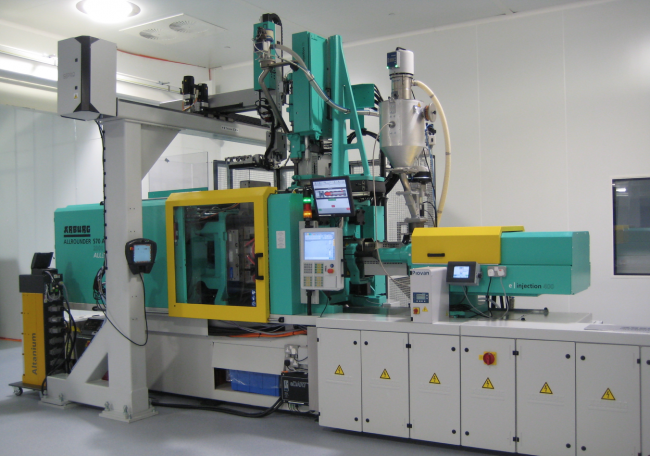 A leading manufacturer of precision components for the medical device and automotive sectors has invested in an ARBURG multi-component injection moulding machine in response to soaring demand for its products. Trend Technologies Ireland, a manufacturer of precision injection moulded components and sub-assemblies for the medical device, ICT and automotive sectors, employs 190 people at their site in Mullingar, where it has been operating for 36 years. The site is one of ten Trend Technologies sites globally, and is the company’s centre of excellence for injection moulding. The company invested €3 million over six months to expand its ISO Class 7 cleanroom manufacturing facilities in Ireland by 50 per cent in response to demand for high quality medical device components. The investment included the addition of electric injection moulding machines, including a new ARBURG Allrounder Alldrive 570 A 2000 400/70 200-tonne modular electric multi-component machine and robot system. “This model is the highest specification modular electric machine ARBURG manufactures, and has been specified to produce critically demanding parts to extremely high tolerances,” says Colin Tirel, managing director, ARBURG Ltd.
At Trend Technologies, the ARBURG Allrounder Alldrive 570 A 2000 400/70 200-tonne multi-component injection moulding machine features two injection units in a horizontal/vertical configuration. ARBURG has been producing multi-component machines since 1962, and this remains the most popular layout for the injection units. Trend Technologies’ original brief was for the machine to be able to run at high volume, but have the flexibility to produce a number of other components if required. Also included in the specification was the requirement for the machine to be able to operate and monitor an existing electric rotary unit. The machine was completely configured at ARBURG Lossburg to the customer’s specification, which included water manifolds mounted on the moving and fixed platens. Individual water flow zones are monitored for temperature and flow. This ensures that if there is a failure in any of the circuits within the mould, it will be sensed by the machine’s control system, and the moulding process will cease. “Trend has chosen an ARBURG machine for this challenging moulding project and the machine is integrated with RJG’s eDart system and Sepro-controlled robot to provide a technically superior manufacturing solution,” says Trend Technologies managing director Dónal Lawlor. 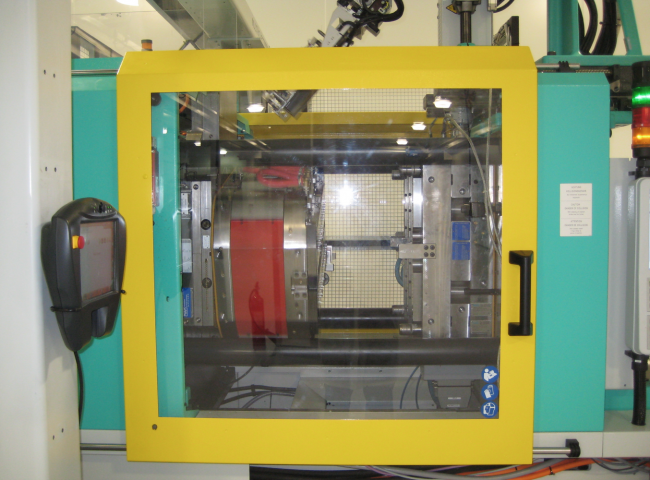 The Sepro robot system was installed to work with the ARBURG machine during production. The RJG eDart pressure monitoring system within each of the 16 cavities eliminates the need for an expensive vision inspection system, says Trend Technologies. This monitoring system sends a good / bad part signal to the Sepro Robot for automatic segregation. The cell is now installed in a new cleanroom at Mullingar to manufacture parts for a medical assembly – a connector for negative pressure wound therapy products. “Trend won this business because we proposed a technically superior solution offering reduced cycle times and part costs,” says Lawlor. The Trend Technologies investment programme also involved the construction of a new cleanroom for post-moulding operations, and the addition of the latest digital printing, laser welding and vision recording equipment to record individual serialised components.